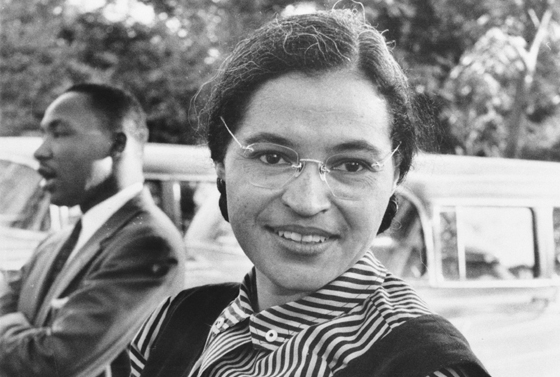 “The First Lady of Civil Rights”, Rosa Louise McCauley Parks refused to give up her seat to a white passenger on December 1, 1955 in Montgomery, Alabama. When Rosa Parks kept her seat on that bus, she stood up for the dignity and civil rights of every African American in the United States. Her very patriotic and brave act was the stimulus that helped strengthen the Montgomery Bus Boycott and civil rights demonstrations around the country. Parks actions became a symbol of support against the crude racial discrimination that was prevalent in the south and many parts of the country. Her arrest for refusing the bus drivers demand to give up her seat on the bus to a white person helped initiate support for the cause of eliminating segregation. Parks at the time was secretary of the Montgomery Chapter of the NAACP, but she acted that day on her own. Rosa Parks was born on February 4, 1913 in Tuskegee, Alabama and died on October 24, 2005 in Detroit, Michigan at age 92. Rosa Parks receive an award from President Bill Clinton.